So where does RPA fit in all of these services? If you notice, in all of the above examples, the decision to purchase and use a software tool was taken at the highest level of the organization. Each choice was a strategic choice and RoI was a huge factor in determining final purchase. robotic process automation is the same. Treat robotic process automation as a strategic asset for your organization. As a business, you may have vendors for a number of support services such as printing, property maintenance, background verifiers, third-party QC and so on. These are necessary business expenses. Cost may be the major concern while choosing a vendor or solution. RPA done right can contribute to both the top and bottom line of your company. As such, draft strategic goals for robotic process automation in your organization and treat it as an investment. 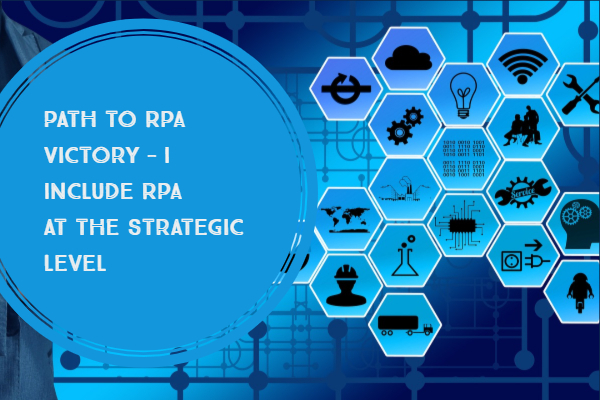 As of 2019, RPA is all set to make a huge difference to small and medium businesses as the platforms and service providers become more affordable. The next iteration of long-term sustainable competitive advantage is sure to be driven by RPA automation handled at a strategic level.